This campaign plays in 500 A.D., all characters and places are fictional. Your technology advances as you're finishing the chapters. You are either building your own castle (mostly by scratch), expelling barbarians, invading rivals, settling in hostile territory or collecting resources to prepare for the next mission. I will update the campaign later and add more chapters (not 1 or 2, probably way more) with new content, to keep it as fresh as ever. It's been many years since your father had marched his army into the Southern Lands. His prolonged absence in the Crestthorn Lair has sparked rumors among the peasantry, it has soon spread among his rivals. You've been called to inherit the lordship, as his peasants fear an impending raid. I am pretty new to the mapmaking scene, so I am an amateur and do not know all the tricks, but I hope that my custom campaign is fun to play. My English is also not the very best, I apologize for grammar and spelling mistakes. I enjoy Stronghold 1 and SHC the most, it is sad that people think it's a dead game. Most people liked playing the "dead" game even after more than a decade. Do you know how to add mods to the game? I guess Stronghold lacks modification tools. It would really help the community to stay alive after so many years, if there were any possibilities left to add content to the game itself. Feel free to comment, to give your own opinion on my custom campaign and to use it for your own projects. I would see suggestions as a gift, it would really help me at what I do, so please give me some. I was about to change my name to Lord Fossil when, by a stroke of good fortune I happened upon your campaign. Since all those magnificent maps were issued years ago, I could not share my comments and it was getting rather lonely. Thank you for keeping SH HD alive and I believe that there are many others who think that this version was by far the best and the most popular. I played the first chapter and it was simple and easy; the beginning of a settlement on the riverbanks, surrounded by lush vegetation and wildlife. That is how such campaigns should start. I would have liked a couple of wooden platforms for my archers though, that would have been acceptable with the limitations. I am looking forward to play the whole evolution of this adventure. Thanks again for the campaign. The invasion maps are easy for my level, barring chapter 5, which was too hard to complete, even on easy difficulty. Did the siege maps perfunctory, I am neither good at them nor do I enjoy sending men armed with sticks against Armour. (I like eco-siege though, one can plan one's strategy). Chapter 10 was easy, but difficult to finish. I Set the map to play itself for a couple of hours. when I came back my very sinful peasants were had repented and been blessed. Had to ordain more priests than peasants. 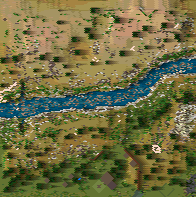 All ten maps play on an interesting terrain. All in all, it was fun and thanks again.